DIRECTLY ON NUMBER ONE RATED BEACH IN THE USA SIESTA BEACH!!! Included with your stay: Complimentary Bicycles, Beach chairs, Beach-Towels, Free-rides around Siesta and a 7-day week office for your convenience and guest needs. Beachfront home on Siesta Key Sunset Point. Siesta Key Beach is the number one rated beach in the USA. Walk out of your front door to the sugary white sands of Siesta Key. This 5 bedroom 4 bath home spectacular views of the Gulf of Mexico.Enjoy these views from your multiple balconies on 2 separate floors, or from your own Master bedroom or Living Room areas. The bedrooms are all very large with plenty of room for the whole family. The large dining room and kitchen are perfect for entertaining. 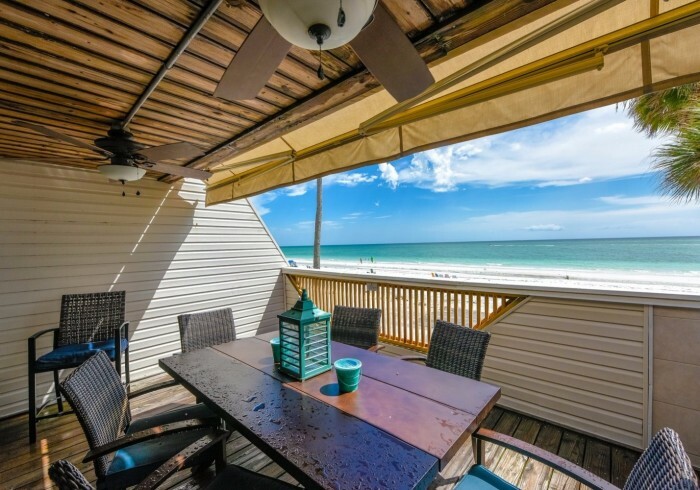 The outdoor entertaining areas and Balconies offer the best views in all of Siesta Key. You are right on the beach!!!! The unit also includes a very convenient outdoor shower, and use of the pool at Siesta Key Beach Resort and Suites!! !